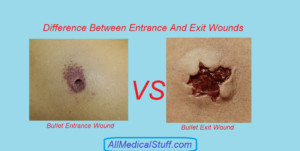 Usually Entrance wounds are smaller, rounded or oval with inverted edges, have abresions etc as compared to exit wounds with some exceptions as well. 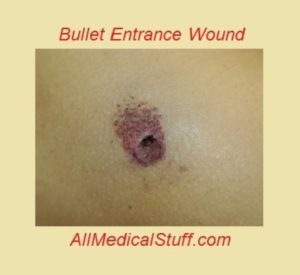 If there is firm contact, entrance wound might be larger otherwise entry would is always smaller. While exit would are larger due to tearing out of muscles. Exit would is usually irregular and torn. While entrance would depend on angle of strike. Like if the angle is perpendicular, the shape of entrance wound would be round. And oval in case of oblique etc. In case of entry wound, clothes are turned in into wound. While in case of exit, it may or may not be turned out. 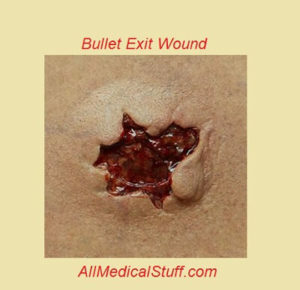 It is profuse in exit wounds while mostly slight in case of entrance wounds. 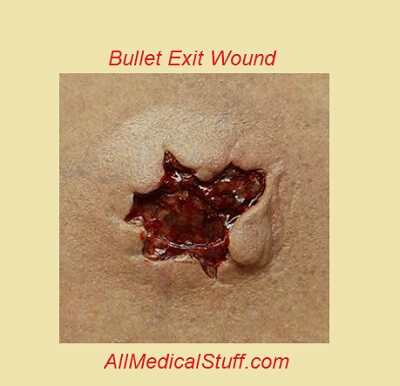 Usually the edges of entrance wound are inverted and that of exit wounds are everted. But it can also be everted in case of entry wound if there is fatty tissue or firm contact over shallowly situated bone. There is collar of abrasion and contusing and smudge collar around margins of entry wounds while they are absent and case of exit wounds. The color of track of entry would is usually pint in a new entrance would while it is not in case of exit wounds. On microchemical or radio logical examination entrance wound can have a lead ring. While it is absent in case of entrance wound. This may also be present in case of entry wounds at appropriate distances. While mostly absent in exit wounds but can be present when there is an exception of another overlapping wound. Here are some of the images of entrance and exit bullet wounds that would help you to understand the above mentioned differences.